There are thousands of RV fires each year. 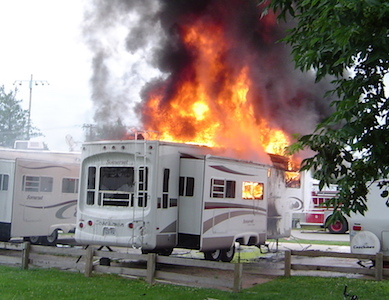 “An RV can burn completely to the ground in as little as six minutes,” according to RV expert and author Mark Polk. You probably have a fire extinguisher or two in your rig, but do you remember how to use them in time of need? Identify an ‘unserviceable’ fire extinguisher that should be replaced. Describe the types of fires upon which their fire extinguisher will be effective. Explain PASS, the four steps to operate most fire extinguishers. Use or watch others use a fire extinguisher to extinguish a fire such as a kitchen or engine fire. Sign up for this safety seminar on the Fun Days Sign-up Sheets in the Big Room in the Clubhouse. This entry was posted in Events, Life at Timber Valley, Safety. Bookmark the permalink.